Late in the summer, the workroom had the opportunity to play a small part in an initiative that Chatelaine staffers had created to donate money to families in need over the holidays by selling reusable gift bags they had sewn from thrifted and vintage fabrics. An enthusiastic crew of happy sewers arrived at the shop with piles of fabric, trim and even baked holiday treats from the Chatelaine test kitchen. (yum!) They quickly set up a production line and whipped up 46 colourful totes to sell for their cause in just a few hours. 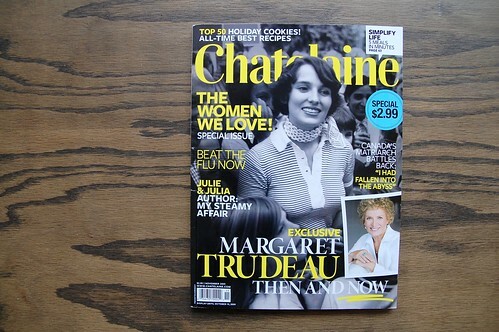 You can read about this great event in the November issue of Chatelaine! 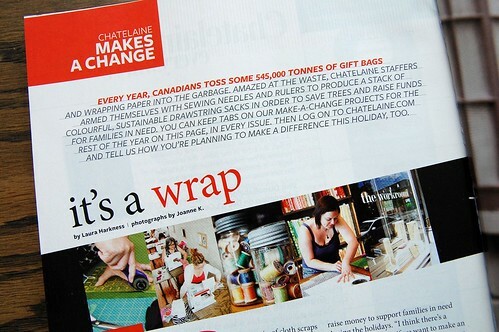 Katie Dupuis from Chatelaine also runs a crafty blog called, “She’s Crafty”. I was super flattered to be her “Crafter of the Month” for September. Thanks Katie! One last thing. 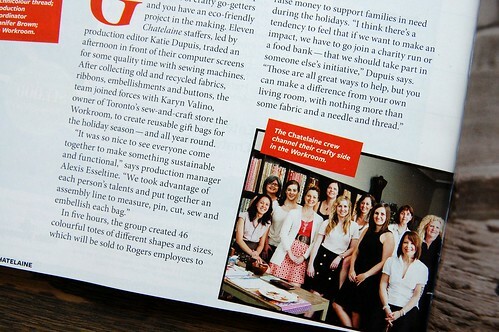 the workroom and some of our workroom friends have become stock photography! Photographer Darren Kemper arranged a photo shoot at the workroom in the summer to get some shots of young people sewing and crafting. It was a pretty fun afternoon, ‘pretending’ to sew and teach sewing while Darren snapped our photos. There was a heck of a lot of laughing that afternoon. If you scroll through the photos, you’ll also see a photo shoot that was done with our friends at the Knit Cafe. I wonder where these stock photos might end up?!? Congratulations on more success Karyn! eagle eye, ladies! i sent the photographer a note about the ‘sowing’ description, so that he can let corbis know. i doubt that people wanting photos of photos of ‘seeds’ and things will want those crafty photos!